Installing an awning for your customers is a simple and value-building way to provide a greater customer experience. A commercial awning installed at a restaurant in the heart of San Francisco can provide relief from sun or light rain for foodies waiting in those long lines. The summer heat can be easily beat by our commercial awnings in San Jose and other South Bay cities – providing relief both indoors and out. Retractable awnings from European Rolling Shutters can serve as a multipurpose solution for a business that wants to expand their outdoor space, while providing interior comfort and energy savings. From visual to functional advantages, strategic placement of commercial retractable awnings will offer nothing but convenient benefits for your business. The main function of awning is, of course, to provide shade and comfort. Prior to air conditioning, many homes and businesses relied on awnings to help keep cool. Did you know that retractable commercial awnings minimize solar heat gains? 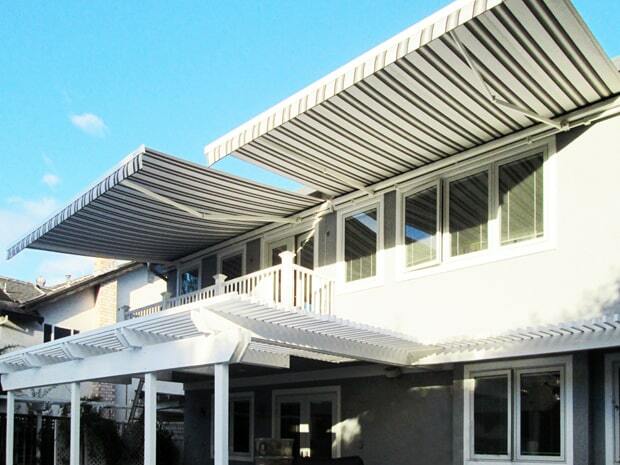 According to the National Park Service Presentation Brief, motorized retractable awnings can reduce heat gains up to 77 percent in east-facing windows and 65 percent in south-facing windows. That means awnings offer a simple and green solution to keep your business cool – which decreases the need for excessive air conditioning and ultimately lowers monthly energy bills. They also will protect your curtains, floors, rugs and furniture from sun damage. Our Commercial Awnings can be customized with your Business Name Help Increase Visibility! 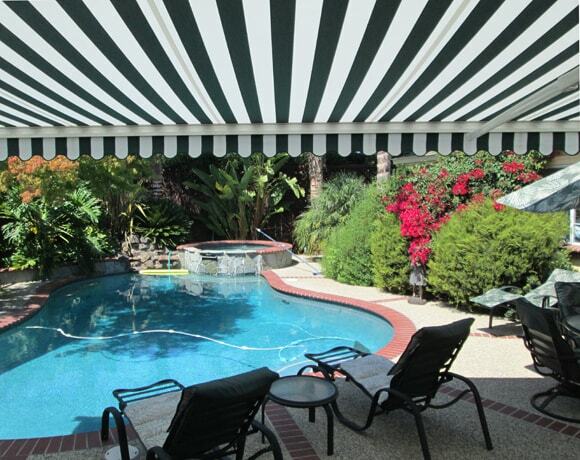 ERS motorized awnings are available in an array of styles, fabrics, and colors. Whether your business needs solid colors, stripes, textured or tweed fabrics, ERS offers over 150 awning fabrics to choose from. With an attractive design and color combination, your business will certainly grab the attention of anyone passing by. We offer 150+ standard fabrics & patterns, including solid colors, striped shadings, textured & tweed fabrics, including Sunbrella, Dickson, Sattler and Markilux-branded fabrics. Our sales consultants with work with you to determine the best awning fabrics and styles for your storefront. They can even be a great marketing piece – customized to include your logo, color scheme, and messaging. In addition to offering your business energy savings and a polished look for a striking first impression, ERS retractable awnings also increase space and give businesses flexible options. They instantly offer comfortable outdoor, shaded seating which is advantageous for businesses that require more space to accommodate customers. Commercial awnings have come a long way. Today’s high-tech awnings offer added convenience and control over dated fixed awnings, metal awning or crank-based awnings. 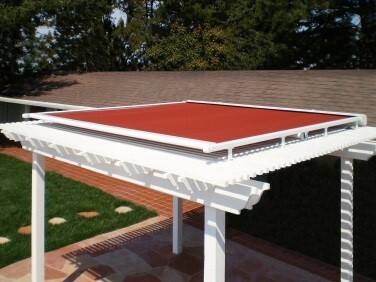 Our retractable awnings can be installed with awning wind sensors and other weather sensors. These weather sensors on retractable awnings will automatically retract the awning during extreme weather to prevent damage. The vast majority of our awnings are electrically-controlled with Somfy automation systems. This allows business owners to conveniently control awnings with a remote, wall switch or the Somfy myLink app on their smartphone or tablet. Businesses can also opt for the addition of our retractable solar shades that drop down from the end of our awnings. This unique combination minimizes sunlight hitting your customers and reduces glare while maintaining a clear outdoor view. Retractable awnings can be a beautiful and functional addition to any type of business. Restaurants benefit from exterior rolling shutters (or our retractable pergola covers) to offer convenient outdoor dining, or to keep sun glare and heat to a minimum for indoor diners. Retailers adore commercial awnings for the added style, option to customize for marketing, and energy savings. Office buildings, healthcare facilities, government buildings and more can also take advantage of the energy efficiency and sleek looks of today’s commercial awnings. 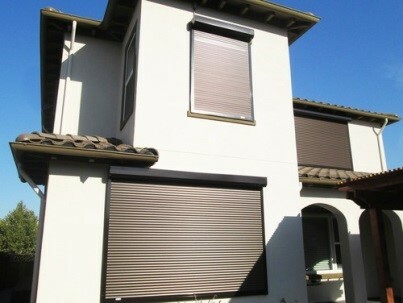 Contact European Rolling Shutters, the Bay Area’s exterior shading expert since 1983, for more information on how to choose the best shading solution for your business or home.